In the 10-day period ending Oct. 25, an average of 26 television commercials aired per hour for the congressional election pitting Rep. Bruce Poliquin and challenger Jared Golden. Top, a screen shot from one of Democratic congressional hopeful Jared Golden's campaign commercials. Bottom, a screen shot from a television advertisement by U.S. Rep. Bruce Poliquin's campaign this fall. If it seems like you can’t escape television ads for Maine’s 2nd Congressional District race, it’s no wonder. 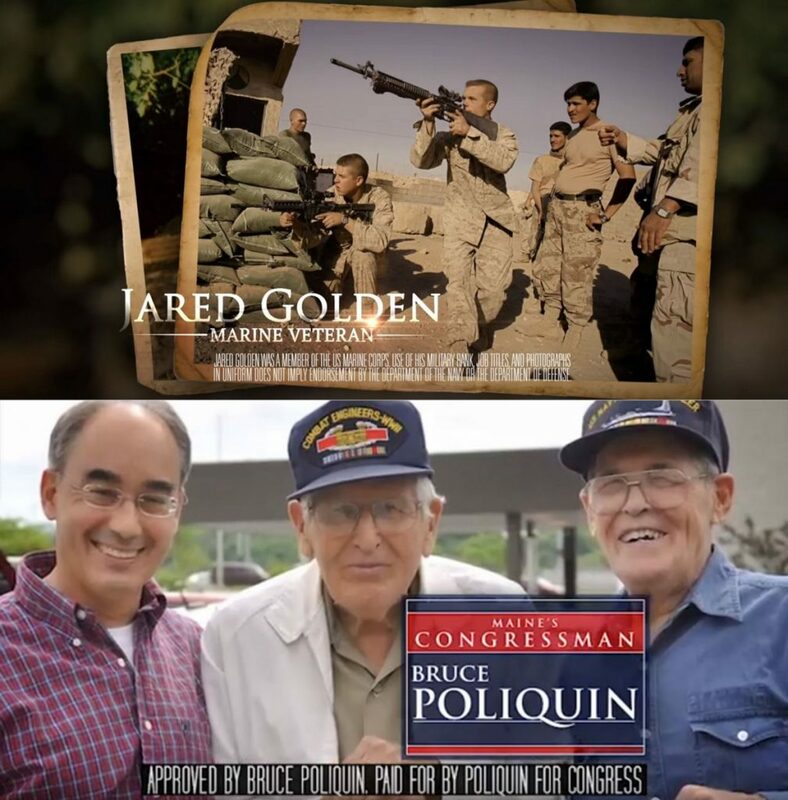 The race pitting Republican Rep. Bruce Poliquin and Democratic challenger Jared Golden featured the most broadcast ads in the country during the 10-day period that ended Oct. 25, an average of 26 an hour, according to the Wesleyan Media Project. Both candidates decry the money that’s being spent, much of it by Super PACs they can’t control, but they’re each spending at a rapid clip. Candidates and outside organizations aired 6,312 ads from Oct. 16 to Oct. 25 – at an estimated cost of $2 million – and there’s some indication the pace may have picked up since then, according to the Wesleyan Media Project website. Polls show that Poliquin and Golden are in a tight race whose outcome may well be decided in a ranked-choice vote by the second- and third-place ballots cast by supporters of independents Tiffany Bond and Will Hoar. During the entire midterm campaign season that began last year, only three districts in the country have seen more ads than Maine’s sprawling, mostly rural 2nd District. The others – in Montana, Georgia and New York – also are in parts of those states where advertising rates are comparatively cheap, as they are in Maine. According to Kantar Media, $17.8 million has been spent on television advertising in Maine’s 2nd District through Oct. 25, the 10th-highest total in the nation. That bought 30,984 ads since the start of the race in 2017. Data gathered by the Wesleyan Media Project found that during the 10-day period that began Oct. 16, the party parity in the commercials was remarkably close, with those helping Golden outnumbering those for Poliquin by 170 – or roughly 6 percent more ads. During the entire campaign, however, Democrats have aired about 10 percent more ads than the Republicans. But Republican-connected super PACs and political organizations have spent more on ads for Poliquin than their Democratic counterparts. There have been 6,164 ads from them aiming to help Poliquin – some boosting him and others attacking Golden – while the Democrats put on 5,648. But Golden’s own campaign has aired more ads than Poliquin’s campaign by a margin of 10,560 to 6,738. The counts of commercials look at buys made for television and national cable. There may well be local cable ads that don’t show up in the totals and there are many ads on social media and websites that aren’t included. Across the nation, a bit more than 1 million congressional race ads have aired for the midterm election. That means Maine’s 2nd District accounts for about 3 percent of the total volume. During the entire campaign, three ads have been shown for the 2nd District race for every two shown in the gubernatorial contest in Maine, including the primaries both the Democrats and Republicans held to pick their nominees.